As today marks International Women’s Day, it’s timely to reflect on the Australian government’s commitments and priorities in implementing the Women, Peace and Security (WPS) agenda’s international policy framework of eight UN Security Council resolutions. The agenda supports the participation of women in peace and security governance, the protection of women’s rights and their bodies, and the prevention of violence. Historically, the ‘prevention’ pillar of the agenda has been somewhat overlooked in favour of close and sustained engagement with participation activities (ensuring that women are involved in peace negotiations, for example, or that women are represented in national security organisations) and protection activities (ensuring that women are protected from sexualised and gender-based violence). Where prevention has featured, it has predominantly related to the prevention of sexual violence in conflict. This is changing, however, as new priorities in the WPS agenda emerge. 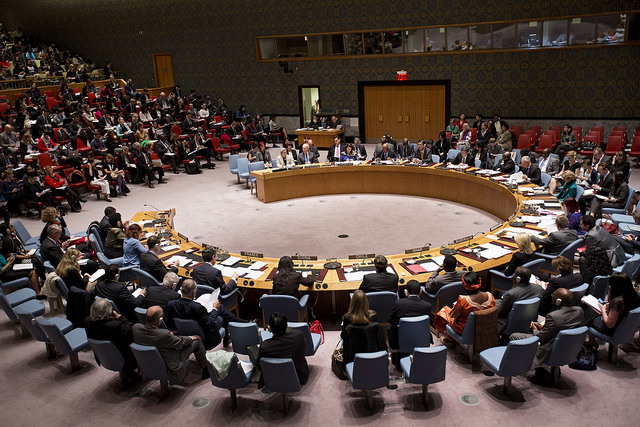 The most recent resolution, UNSCR 2242, brings counterterrorism and countering violent extremism (CT/CVE) into conversation with WPS initiatives. The resolution therefore articulates violence prevention in a new and different way: the prevention of terrorism and violent extremism becomes central to the women, peace and security agenda. Three paragraphs of UNSCR 2242 are devoted to explaining how the WPS and CT/CVE agendas could align better, with priority given to mainstreaming gender in the operations of the UN Counter-Terrorism Committee (CTC) and the UN Counter-Terrorism Committee Executive Directorate (CTED) (OP 11). The resolution also calls for better data collection in this sphere, and ‘the participation and leadership of women and women’s organisations in developing strategies to counter terrorism and violent extremism which can be conducive to terrorism’ (OP 13). In the Australian context, we need to explore what that means both for our commitments under the WPS agenda (which are captured in the Australian National Action Plan on Women, Peace and Security 2012–2018) and for our CT/CVE activities, not least because the government is now beginning the process of consultation around the next iteration of the National Action Plan for launch in 2019. It’s important that this next NAP reflects the integration of WPS and CT/CVE, but it’s also equally important that this integration is thoughtful, sophisticated, and informed by consultation with communities and community organisations across Australia. There have been a number of concerns raised about the creeping integration of CVE with WPS. Those include issues with CVE strategies and initiatives articulated by many working in this field, including cases where program initiatives are poorly specified and poorly understood, addressing neither women, peace, security, nor violent extremism adequately. There’s also often a lack of appropriate gender training for practitioners engaged in CVE program delivery both within the national context and overseas, and a lack of confidence in government and a lack of trust between community groups and state actors. The government needs to state clearly what programs are intended to achieve, to ensure comprehensive gender training and to engage in extensive community consultation, such that community groups are active participants not only in delivery but also in formulation of initiatives. A number of issues are raised within communities of scholars and practitioners about the alignment between CVE and WPS. Gender equality initiatives must be consistently applied and not bartered to appease certain political actors and to achieve specific political ends. Further, there’s often too little attention paid to the gender dynamics of radicalisation and, specifically, to the radicalisation of women and a lack of understanding of the various and often conflicted roles that women play in counterterrorism and countering violent extremism. The Australian government would do well to leverage the extensive research expertise in this sphere, both within and beyond Australia, to ensure that plans and initiatives are evidence-based and pay due attention to gender as a power dynamic as well as the roles and representation of women within the domain of CT/CVE. It’s critical that women are neither instrumentalised, nor put at risk, in the service of CT/CVE. As advocates of the Women, Peace and Security agenda have consistently reminded us, the WPS agenda isn’t about ‘making war safe for women’. Prioritising CT/CVE within WPS in Australia, both immediately and in the next iteration of the National Action Plan, mustn’t pay lip service to the roles and representation of women but truly value women’s experiences and reflect the concerns of communities and community organisations if it is to be effective. What’s next for Australia’s National Action on Women, Peace and Security?